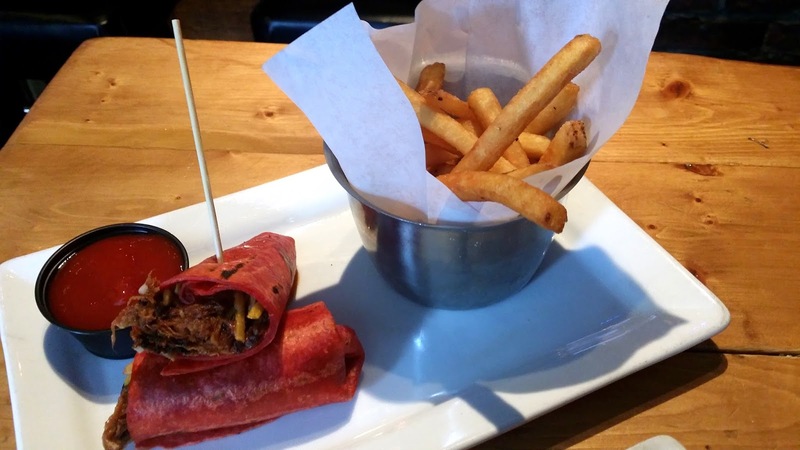 I used to have Boston Pizza pretty often especially on weekends, but never blogged about it. 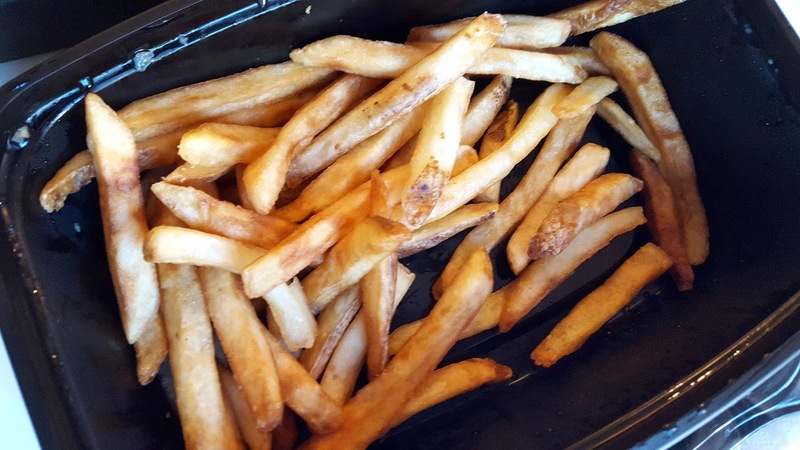 My impression about them was pretty good as they use fresh ingredients and I can customize as much as I can. 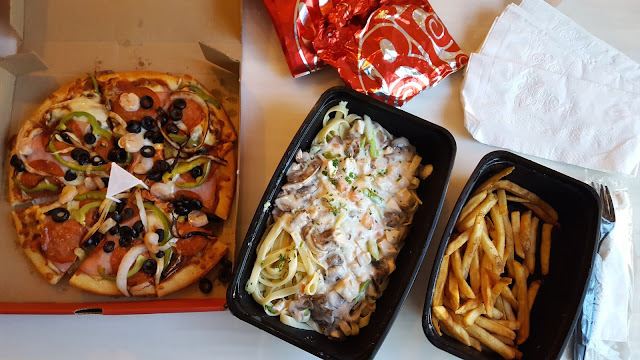 But this time I was very disappointed about the food we got. This was our first time getting a Boston Royal ($18.49 - Small) which was topped with pepperoni, smoked ham, shrimp, black olives, mushrooms, green peppers, onions, and Mozzarella cheese with tomato sauce. First of all, the pizza crust was hard as a rock, and the pizza itself was very tasteless. 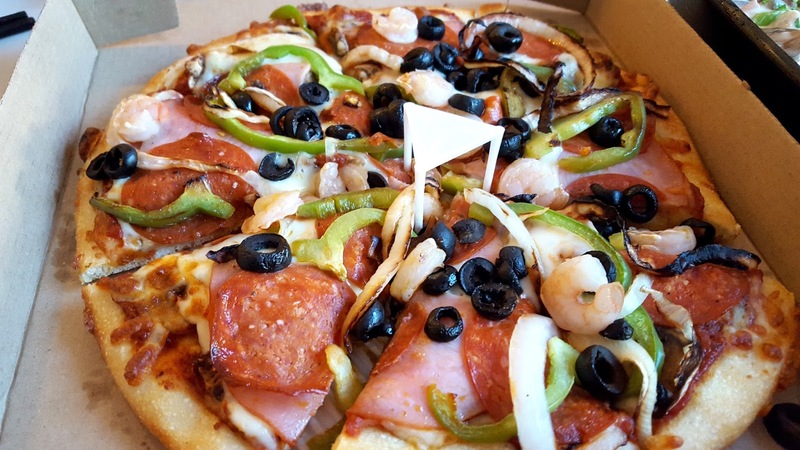 Even the salad with those toppings would taste better than this. I think it wasn't tasty because of the main ingredient of the pizza, the crust, wasn't tasty at all. They had another chance to make this up, but then this Chicken & Mushroom Fettuccini ($16.99) was unbearable. The overcooked pasta was very mushy and soggy. 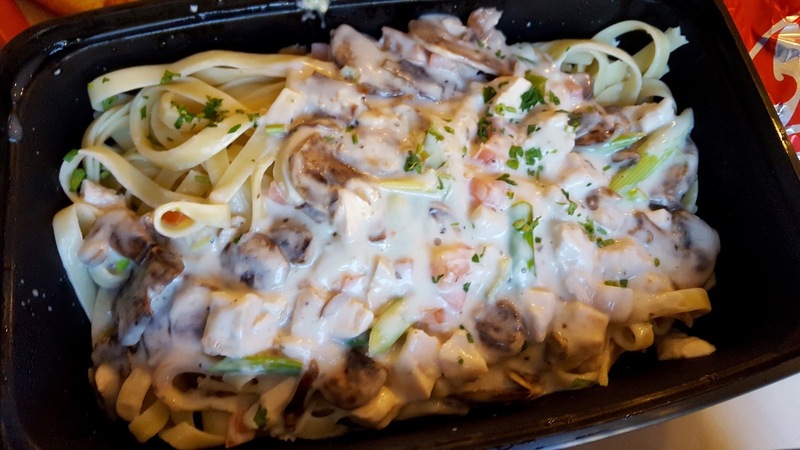 Their signature Marsala cream sauce was bland, and didn't go well with the noodles because there wasn't enough sauce and the sauce it self was very weak in flavours. I don't know if it would taste better if I dined in, but the delivery food was terrible. We even considered to call them back but didn't bother. This is a very harsh review, but I can't help. We were very disappointed and wouldn't order again from this location. I like Atlantic salmon better than sockeye salmon in general because Atlantic sashimi tastes so much more filling and tender/soft to me. Although Sushi Star doesn't have Atlantic Salmon on their menu, it was one of my lucky days because they had it in stock on the day. 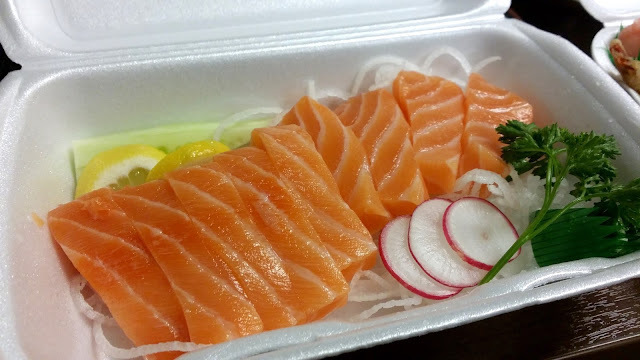 Atlantic Salmon Sashimi ($9.90 for 9 pieces) wasn't as big as what I used to get from other similar restaurants, but it was still cheap. 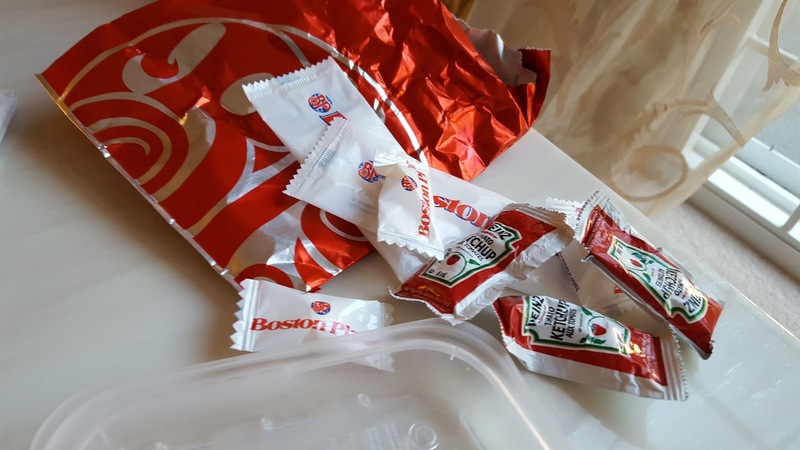 In terms of taste, I wasn't impressed about its quality. 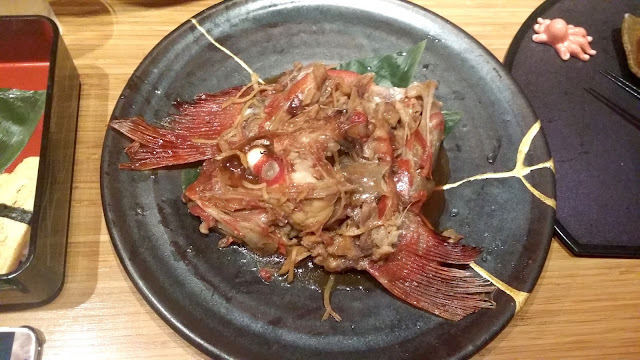 It was somewhat fishy and the knife skill wasn't great. Star Dynamite Roll ($7.95) is a Dynamite Roll topped with avocado, unagi sauce & mayo and tempura bits. 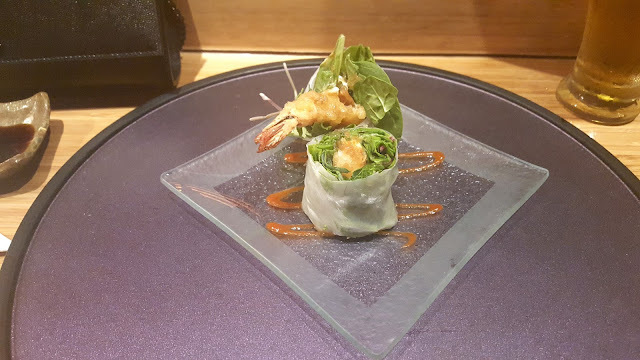 Not too bad in terms of taste, but the sushi rice was a bit hard. Overall, nothing was outstanding but the location was great for me so that I might visit sometime. For my birthday dinner I wanted to have some good Japanese Omakase in Vancouver area. 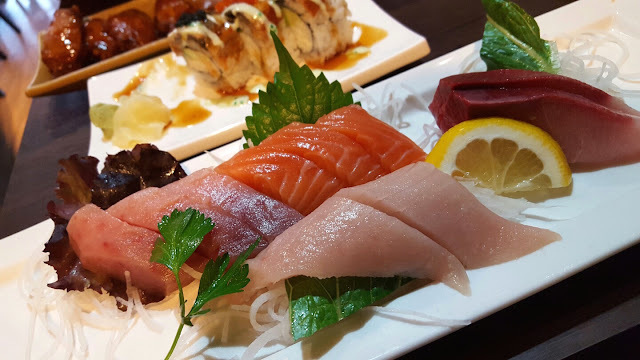 Omakase literally means to entrust, so that when you order Omakase, you are entrusting the chef who will choose the freshest fish and ingredients for your special meal. 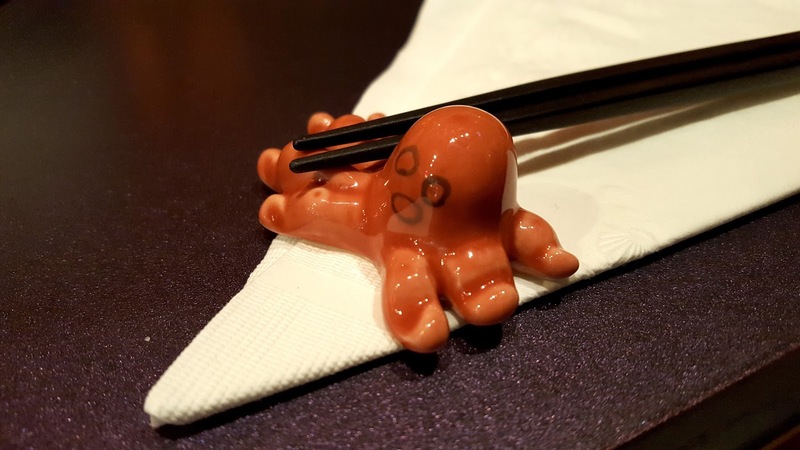 It seemed like Octopus Garden has one of the most high-rated restaurants that offer quality omakase so J and I decided to give it a try. 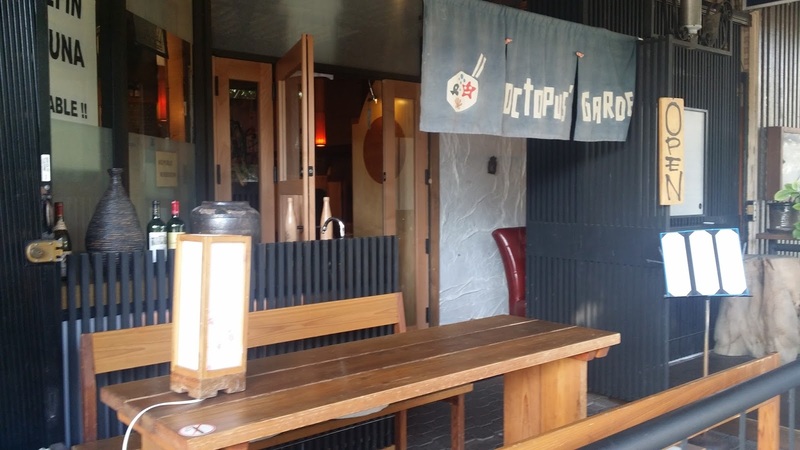 Octopus Garden requires 24-hour notice & reservation for their special omakase so make sure to call them in before dining in. 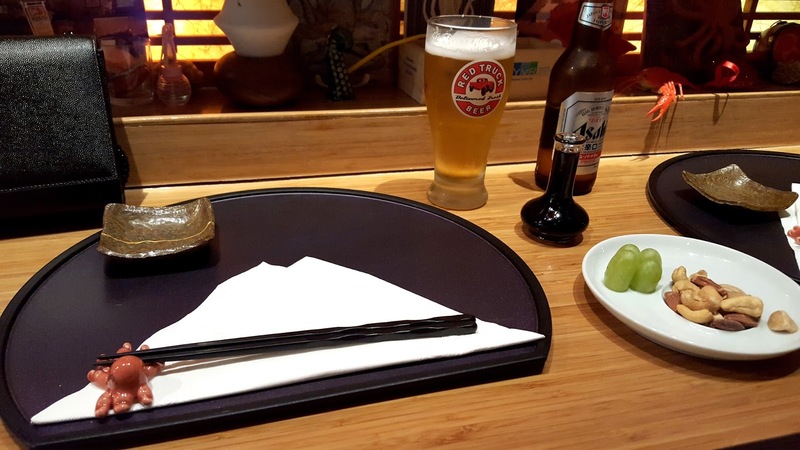 We started with a glass of Red Truck draft beer and a bottle of Asahi. After a few glasses we ordered some warm sake to pair with nice sashimi. 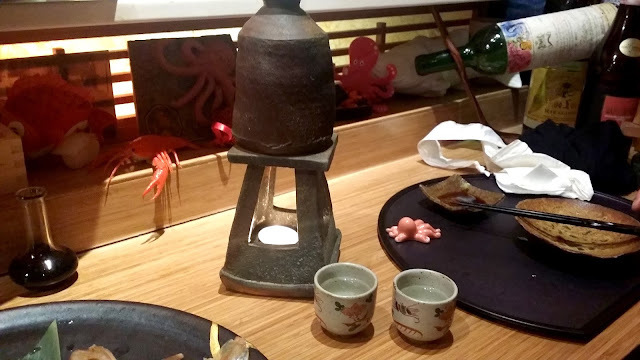 I loved how they put a little candle underneath the sake bottle to keep the sake warm. Sitting at the sushi bar was a great choice as we could try the freshest sashimi right from our chef, Sada-san. Sada is very kind, humble and knowledgeable about the food he provided. 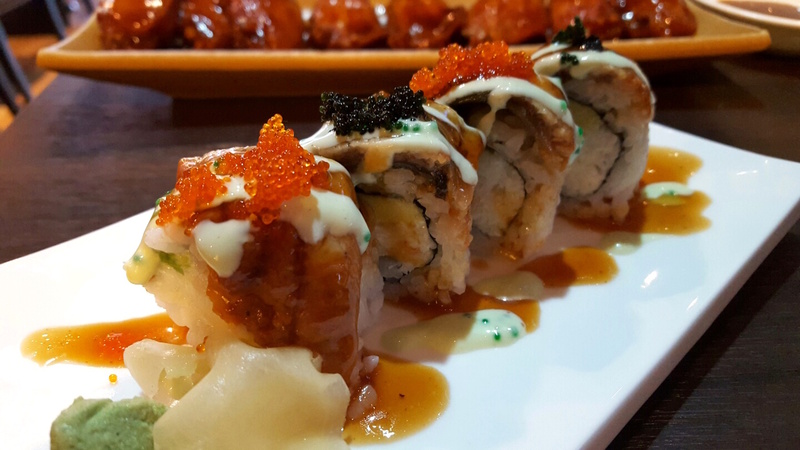 Our omakase experienced wouldn't be satisfying without him! 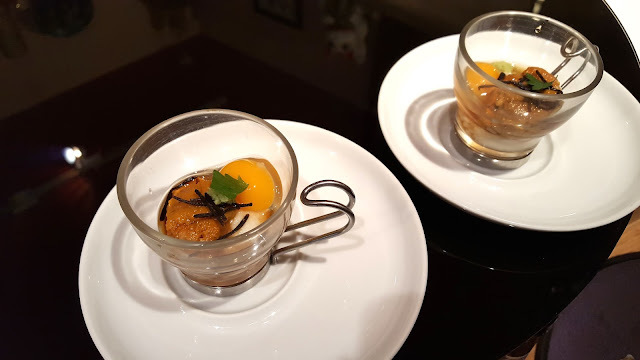 To start with we got Sada-san's signature Nomu Uni Shooter which consisted of fresh sea urchin, mountain potato, quail egg, wasabi, dashi broth (mixed with sake, mirin, soy sauce), rice and seaweed & minty Shiso leaf garnish in a little glass. 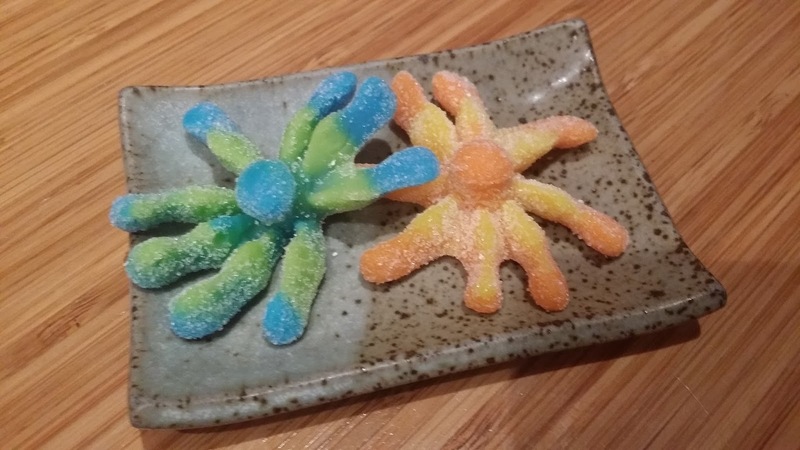 It had a very interesting flavour and texture at the same time. It was creamy, slimy with some savoury flavours from the sea urchins. 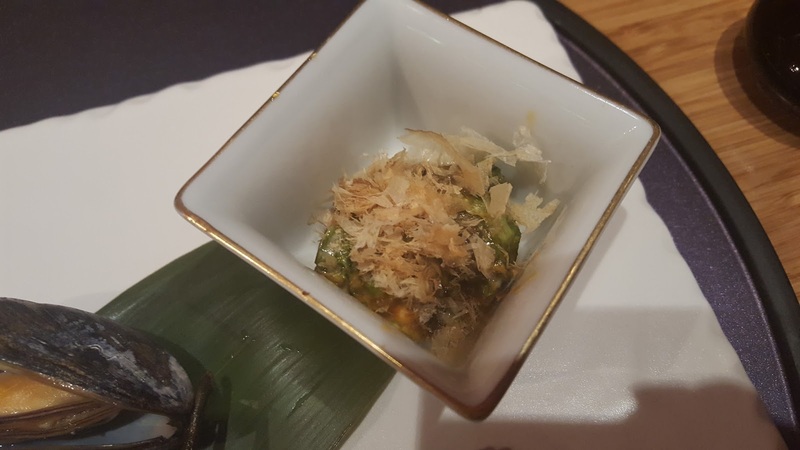 The rice added an extra crunchy texture while dashi broth gave more flavours. Make sure to mix it well and take a shot in one gulp. I personally liked it, but J wasn't sure if he liked it. Ahhhhhh what can I say here... 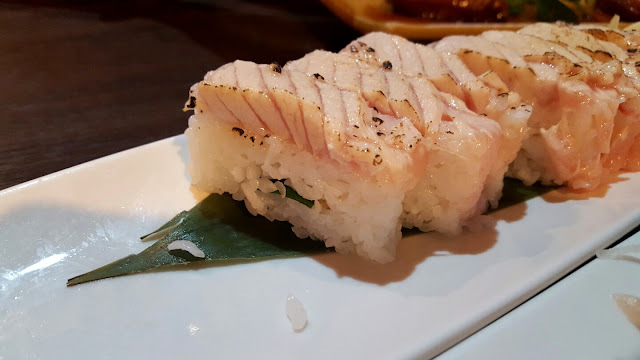 The Bluefin Otoro Nigiri Sushi was one of the best I've ever had. 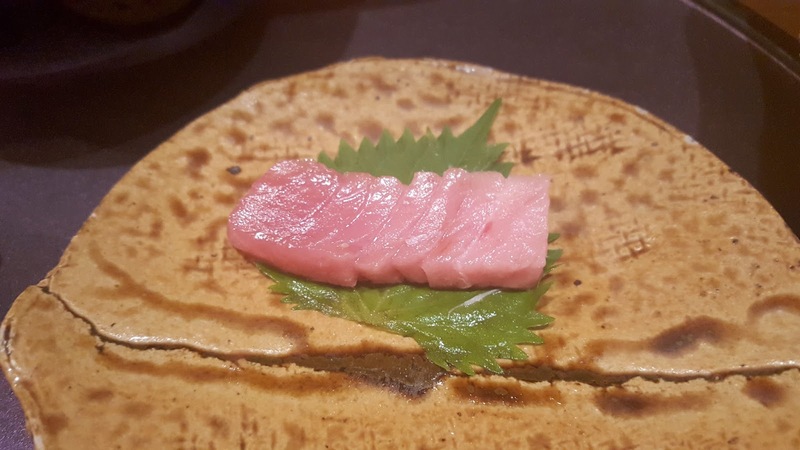 (Bluefin Otoro is the fattest part of the tuna while Chutoro is the name for medium fatty tuna). 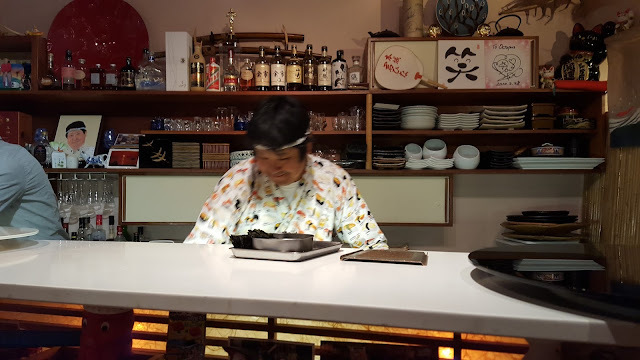 They served us very high quality sashimi and the sushi rice was just perfect. Sada-san put some Japanese sea salt on top of the nigiri in order to pull out the real flavour of the fish. Amazingly tasty, flavorous and this small piece of sushi just melted in my mouth as soon as I put it. Also, the real fresh wasabi had a very clean, pure flavour. I decided to come back after trying this! Our next set of appetizers came along. 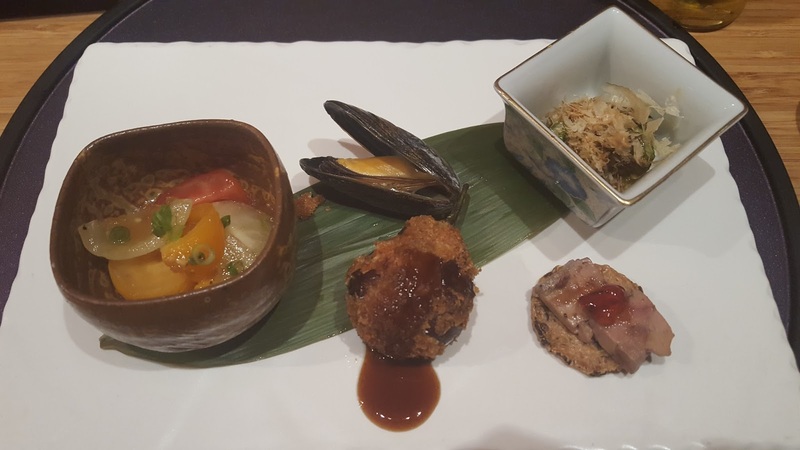 It had 5 different little appetizers that were carefully prepared. The Tomato Salad (left) was very refreshing and its mild-sweet dressing was perfect as well. 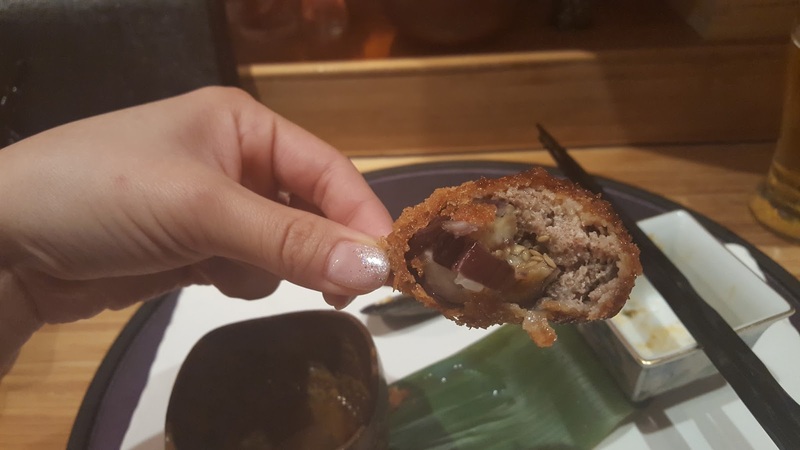 Deep-Fried Baby Egg Plant was stuffed with minced beef and foie gras, which was very crispy on the outside, and juicy on the inside. I liked the sauce which enhanced the overall flavours. Brussels Sprouts Salad was pretty good too. It still hold the firm texture and not mushy. 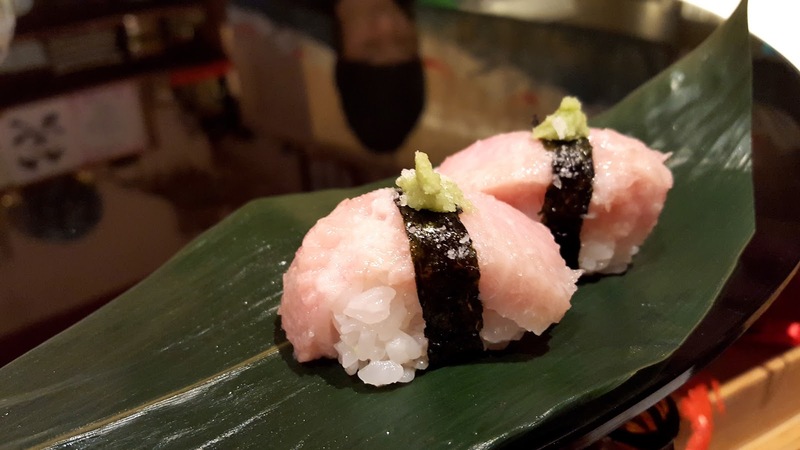 The bonito worked well here to give more enhanced flavours. 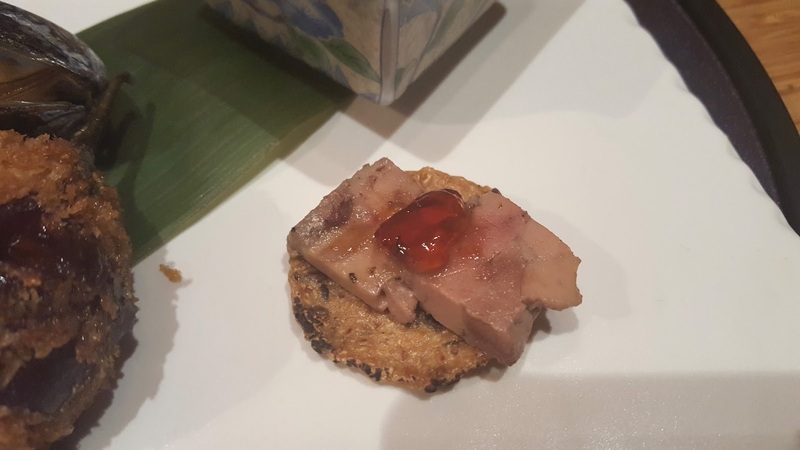 Foie Gras was placed on a savoury sesame cracker, and topped with strawberry jams. It was very rich in flavour, and buttery. 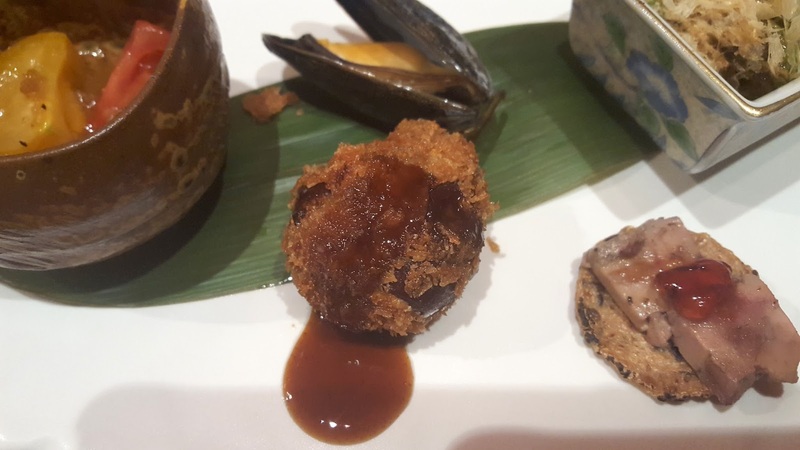 It was very interesting to try soft foie gras with crispy sesame crackers on the bottom. Two very different textures blended well together. Prawn Tempura Spring Rolls were very refreshing. 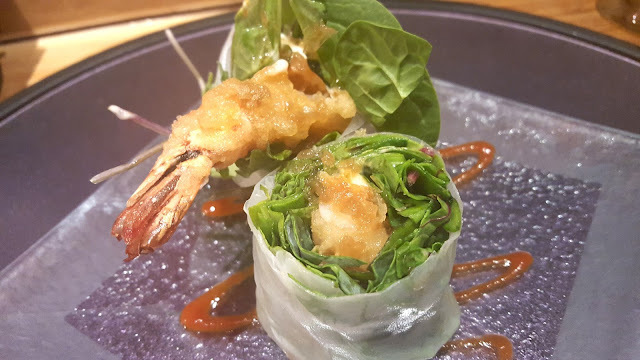 Prawn tempura inside the rolls was still very crispy without any sogginess. Also, the spicy sauce Sriracha prevented the greasiness. Well-done. Finally our sashimi was served in Bluefin Tuna Kama! I could tell each piece of sashimi was carefully cut and placed on the plate. 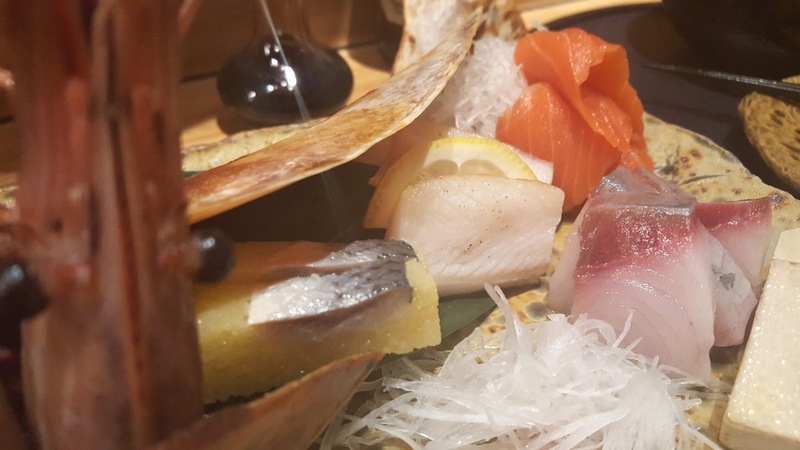 We got 7 kinds of sashimi: Amaebi, Herring Roe, Hirame Engawa, Sockeye Salmon, Butterfish, Bluefin Tuna Chutoro and Hamachi (Left to Right). 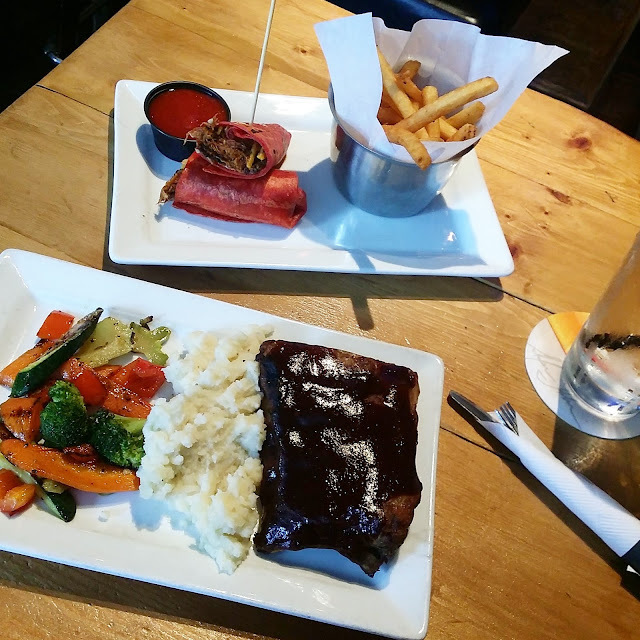 Everything tasted amazingly fresh and good. 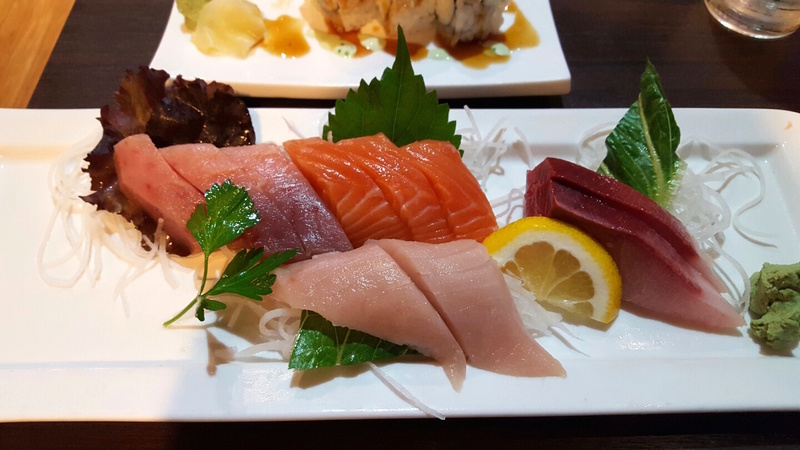 We definitely loved Sada's sashimi selection of the night. My favourite was Hamachi and Chutoro while J loved their Sockeye Salmon and Herring Roes the most. 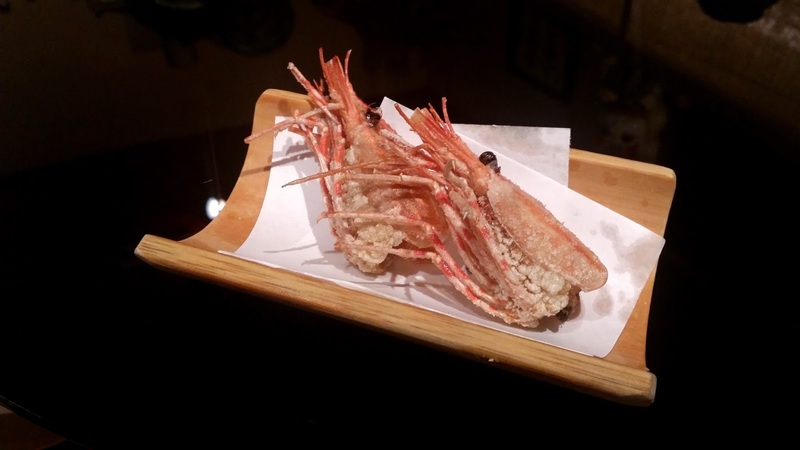 After we finish the sashimi platter, our waitress took the plate and brought us back the deep-fried prawn heads. Very crispy and just salty enough. 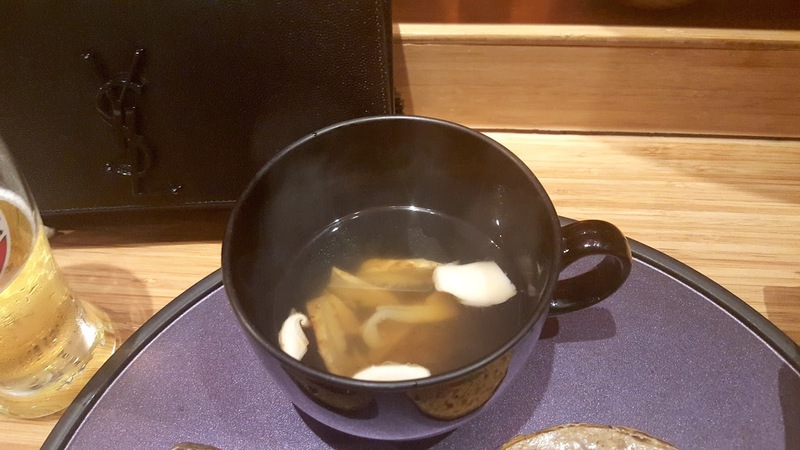 After sashimi we got a flavorous pine mushroom soup (seasonal) to pair with nigiri sushi. J and I both loved it so much. By far the best soup I've ever had in any Japanese restaurants. 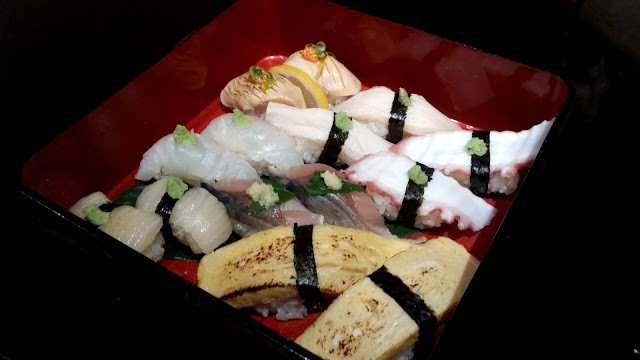 7 kinds of nigiri sushi: Seared Scallop, Hirame Engawa, Butterfish, Geoduck, Mackerel, Tako (Octopus), Tamago (Top to bottom). 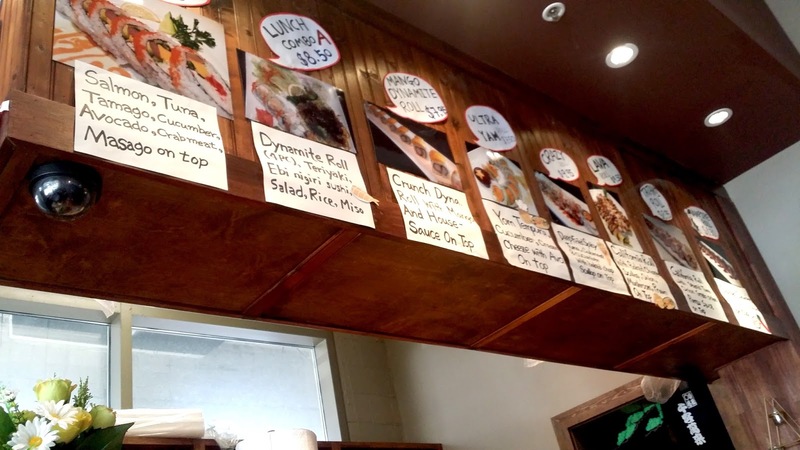 The sushi rice was cooked and seasoned perfectly, and the fish was amazingly fresh. Some of nigiri were lightly seared giving out extra flavour. 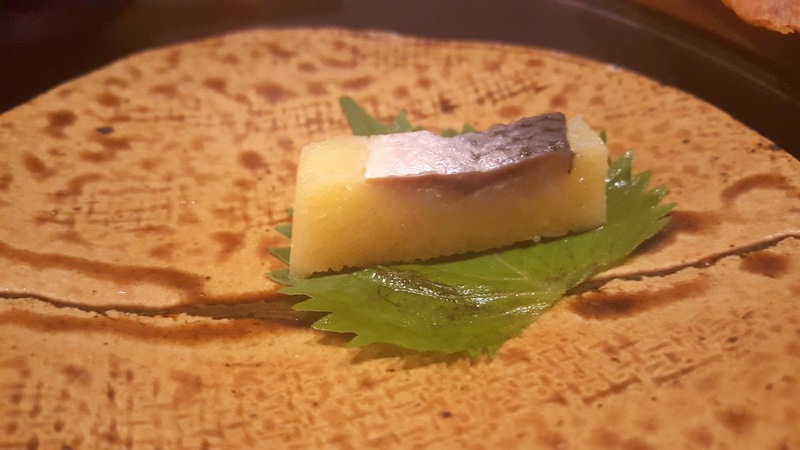 I loved butterfish and tamago! Braised Tai Kama was one of our main dish. I know I keep saying their food is so tasty and delicious, but then there is nothing else I can say other than that... 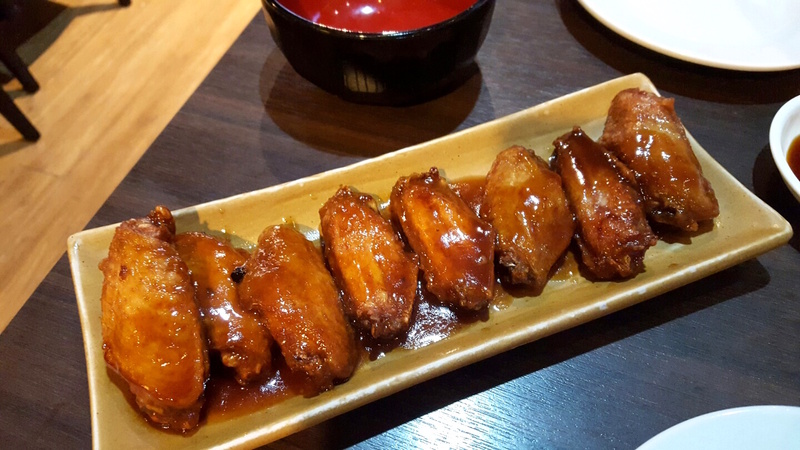 The kama was braised long enough for the meat to absorb the sweet and savoury sauce. There was fairly good amount of meat we could have, and the meat itself was very easily apart from the bone. Yay! 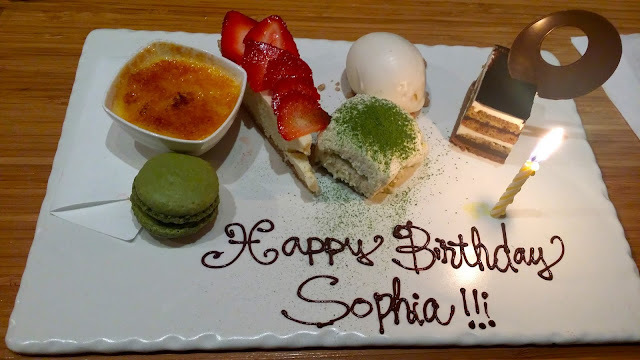 Sada-san remembered that it was my birthday and we got a special dessert platter :) Everything tasted really good and we were impressed by their pastry chef's skills. Creme Brulee with Red Beans, Lemon Cheese Cake topped with Fresh Strawberry, Sesame Seeds Sorbet, Salted Chocolate Ganache Cake, Matcha Macaron & Matcha Tiramisu (Left to Right). 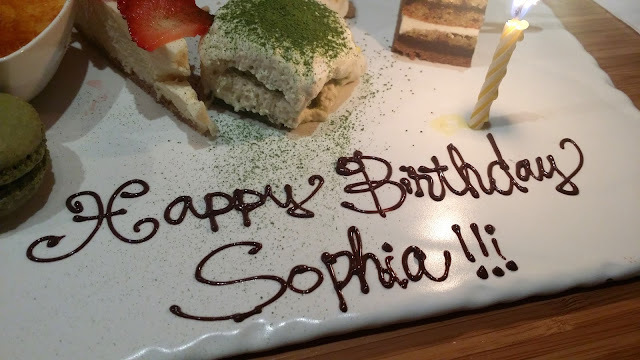 Matcha Tiramisu was my favourite. 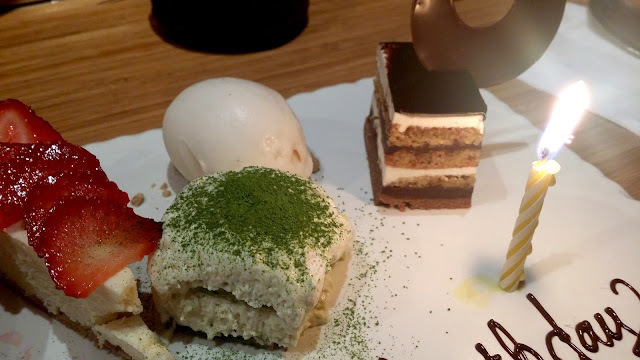 The taste of matcha was in every bite, and the cake was sweet but not overly. The texture was soft, with a perfect blend of fluff! Their signature Sour Gummy Octopus candy to end the meal. 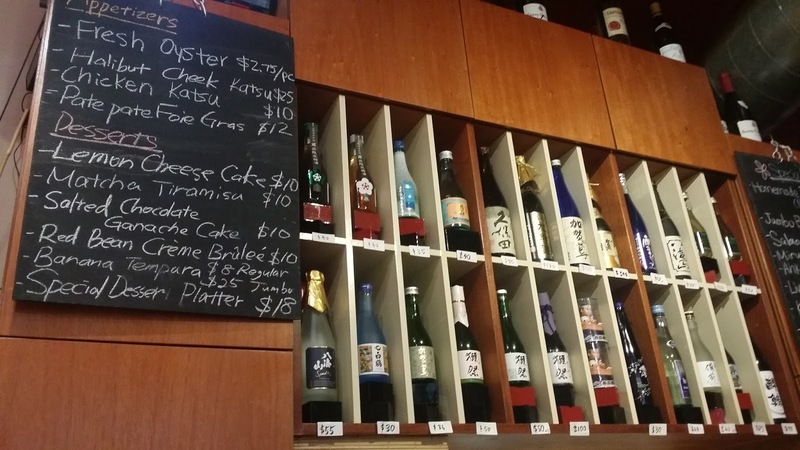 *If you are going for Omakase and planning to have sake or any alcohol, expect to spend $200-$300 for 2 people. 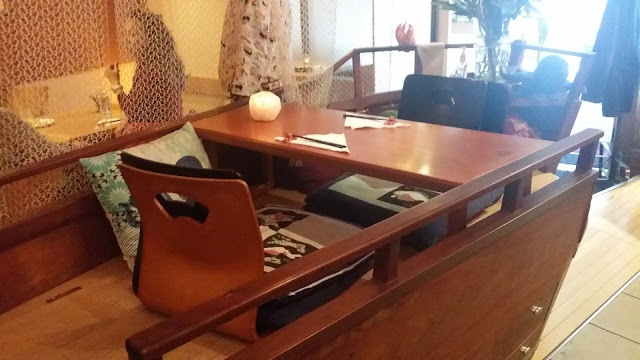 It was really difficult to find seats during long weekend Sunday dinner. 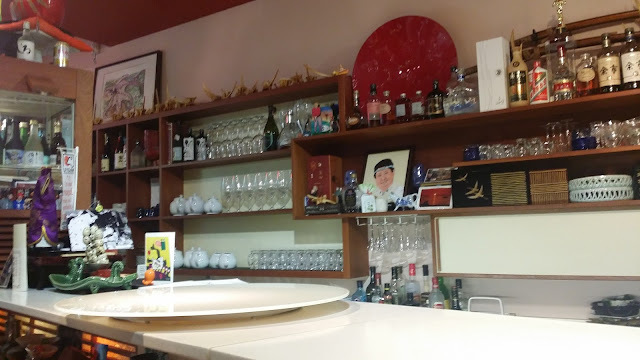 After trying 3 different Chinese restaurants in Richmond, we ended up here at Ebisu. Because there wasn't a long line-up we decided to have dinner here regardless J didn't like their food that much. Chicken Wings ($7.50) with traditional teriyaki sauce tasted pretty good. Couldn't tell if the chicken itself was good quality because the sauce was overpowering everything else. However, the sauce was still good enough to make it tasty. 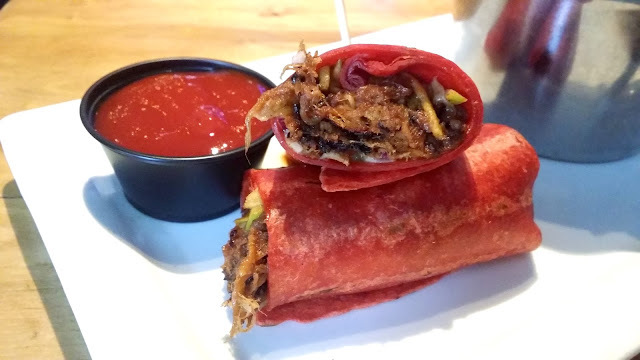 Somewhat crispy on the outside and still juicy and soft meat on the inside. Samurai Power ($6.50 - 4 pieces) was a California Roll wrapped with BBQ unagi, topped with red & black tobiko and unagi & wasabi cream sauce. It tasted pretty good. There was a decent amount of eel, and the sauce was very tasty. 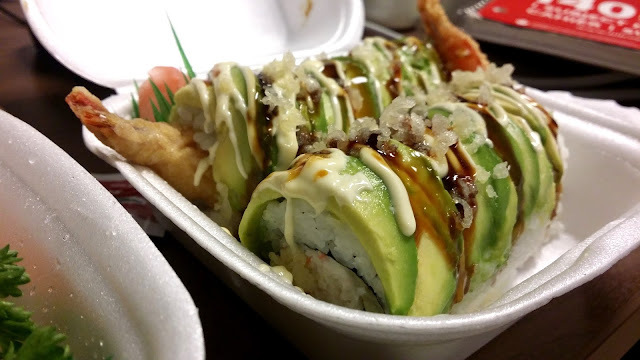 You can get the full size roll (8 pieces) for $11.95. Sashimi Vancouver ($15.95) consisted of Tuna (3pcs), Salmon (3pcs), Yellowtail (2pcs) and Toro (2pcs). 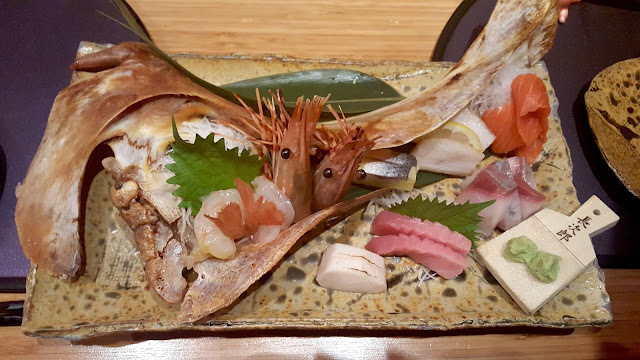 I was really disappointed at the quality of sashimi they offered. Salmon was somewhat tough and tasteless. 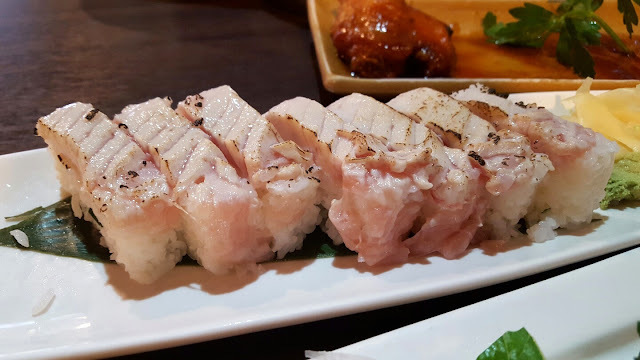 Toro and hamachi were both fishy while missing buttery textures and flavours. 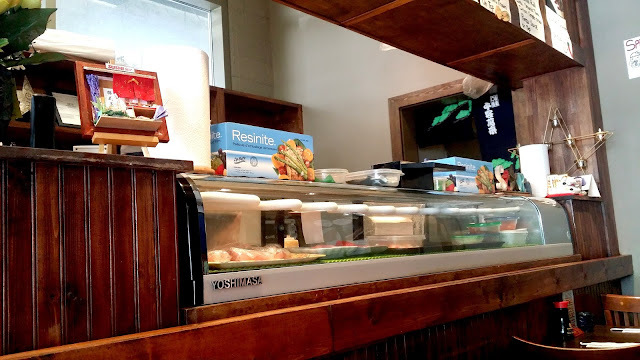 Our waitress seared the Inferno Toro Sushi ($9.99) on the table right in front of us. I was excited about it but then soon after I was disappointed at its quality and flavours. There was no additional slice of toro in the middle of the sushi rice, but some kind of leaves that had a strong flavour. It was similar to perilla leaves but even a stronger smell. 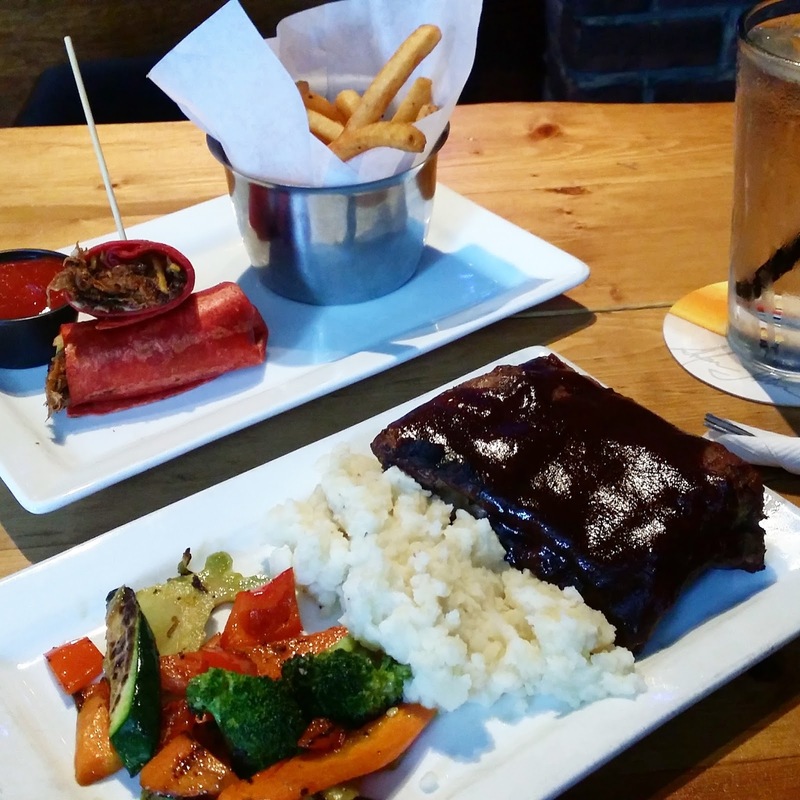 Overall, the service was alright, but the food itself wasn't good enough to attract us to come back anytime soon.